The NSW National Parks and Wildlife Service will be conducting a hazard reduction burn to the east of Newnes in the Wolgan Valley area of Wollemi National Park from May 5 to 7, 2018 if weather conditions permit. See map below. The objective is to reduce overall fuel loads to minimise risks to the neighbouring properties and natural assets in the event of an unplanned fire. 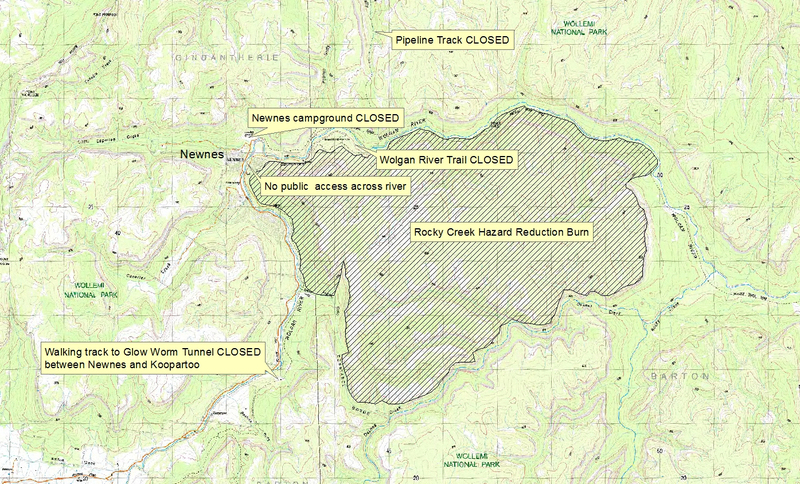 Newnes camping area in Wollemi National Park will be closed for at least a few days and the burn area and Wolgan Valley east of Newnes will be closed for at least one week. Smoke will likely impact properties at Newnes. Neighbours are advised to close windows and clean up any flammable material around their house or assets. If you require any further information please phone the Blackheath NPWS office on 4787 8877.